If you’re shy about money, you might want to get over that right now. Being a freelance writer, whether you work for yourself or a company, is a worthy profession deserving of fair compensation. You are offering a seriously advanced skill to clients and/or companies, and your work is worth fair pay. But what is fair? The answer to this question will, of course, differ depending upon whether you work for yourself or a company. If you work for yourself, you should think about charging anywhere from $15.00 per page to $40.00 per page, depending upon a variety of factors discussed below. Over time, as you gain more experience in the business, you will be able better price projects so you receive a fair wage. In general, you should gear your expectations to your pace; in other words, if you can only write two pages per hour, you might want to charge a bit more per page; if you can write five pages per hour, then charging $20.00 per page seems like a very good deal. 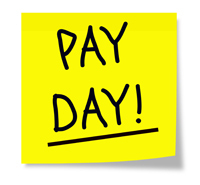 If you work for a company, your rate of pay will be set by the company if you are considered an employee. However, if you bid on projects, don’t expect a great deal more freedom, especially at first. If you work for a good company, expect to earn about 30%-40% per page what they charge the clients. That usually comes out to between $10.00 and $15.00 per page. If you work for a less-reputable company, this percentage might well be less. In general, the less money the client pays per page, the less money you will get. Then again, the faster you can write, the more money you will make (and that holds true regardless of the per-page rate you get). You’ve probably already gathered that in this business, the rate of pay is generally expressed in terms of rate per page. But what is a page? Ah – that right there is the kicker. A page is generally defined in terms of word count, anywhere from 225 words per page to 350 words per page. Clearly, the more words, the more work for you. If you are working for a reputable company, or if you wish to be a reputable independent freelancer, you really don’t want to go too far below 275 words per page, as clients want to know they are getting good value. But shaving even 25 words off a page can increase your rate of pay significantly. Another way to set the rate of pay is to charge more for projects that are due in a short time. These “rush jobs” tend to be priced higher than non-rush jobs, for obvious reasons. While you don’t want to take advantage of a client’s panic or desperation, the reality is that they will usually be willing to pay more if time is short. For that matter, you deserve to be paid more as well, since you will most likely have to juggle some things or pull an all-nighter to make it happen. Generally, rush jobs are priced at $1.00 to $3.00 more per page, depending upon just how tight the deadline is (which also, in part, depends upon how long the paper is). It’s also a good idea to price projects differently based upon the level of study. Model essays for English 101 are, quite frankly, easier to write than model essays for a doctoral-level student, and both should be priced accordingly. In companies, each level of study (high school, college, university, master’s, and doctoral) is generally represented in step-wise fashion where prices are concerned, with anywhere from $3.00 to $6.00 per page separating each level. Along those same lines, legal papers and medical papers are priced higher, as are projects requiring the use of statistics or other highly technical requirements. Once you know how much you will be paid, you need to determine how you will be paid. If you work for a company, they will take care of that, so this section is irrelevant. If you work for yourself, however, it’s important to know the pros and cons of each kind. First, get used to the fact that you will need to accept credit cards one way or another. Purchasing services or products online is facilitated by the use of credit cards, and you aren’t going to find many clients willing to send you a check for your services. There are two ways to go about this: accepting credit cards directly, or routing them via PayPal. In general, you are better off routing whatever you can through PayPal (which is useful because it can work with people who don’t have PayPal accounts). PayPal has more protections for vendors than credit card companies do, so that chargebacks tend to be settled favorably for the vendor more often when they happen via PayPal. The main drawback is that PayPal charges fees to vendors who accept money through their online banking services. Another option to offer is Western Union, which is fabulous for you because there is no possible way the client can take back the money. However, there are fees incurred when using Western Union, so clients can be hesitant to use it; if you offer a discount to offset the fees, though, they might be more inclined to go that route. This can be especially smart when the project is big and the deadline is tight – there is an extra measure of protection there for you as the writer. In fact, there is nothing wrong with insisting upon payment via Western Union, Money Gram, or similar services for such projects.